SUPERFLEX is an artists’ group founded in 1993, in Copenhagen, by Bjørnstjerne Reuter Christiansen (1969), Jakob Fenger (1968) and Rasmus Nielsen (1969). They describe their projects as ‘Tools’, that work as proposals for social change, inviting people to participate in the development of experimental models that alter the conditions of economic production, and the impact upon the environment. Often their projects are related to alternative economic systems, democratic processes of self-organization and linked to their avowed interest in political and social engagement on a local scale. They do not place themselves in opposition to existing systems, but unpick the political, economic and communication strategies that have been put in place in a particular social context in order to make them more visible. Thus SUPERFLEX intervenes in places where it appears necessary to implement a ‘counter-economic’ solution by experimenting with means of alternative production. They conceive of their projects in response to a specific context, whether it is that of an artistic institution or a social situation and create works that often establish a link between these two realities. They also make a distinction between two types of projects with different temporalities: works that occur during an exhibition and others that evolve over several years. Thus, since 1997, they have been working on a biogas system (SUPERGAS), first installed in Kenya, then Thailand and today in Mexico, perfecting at each stage the means of production, utilization and commercialization of this system. The project, GUARANA POWER, in which the artists developed a drink, together with a local farmers’ cooperative from Maués in the Brazilian Amazon who cultivate the caffeine-rich berries of the guarana plant, is one of these sustainable projects that create a real financial economy. These artistic activities are not necessarily opposed to commercialism and globalization, but try instead to render economic structures visible and to establish a new balance. 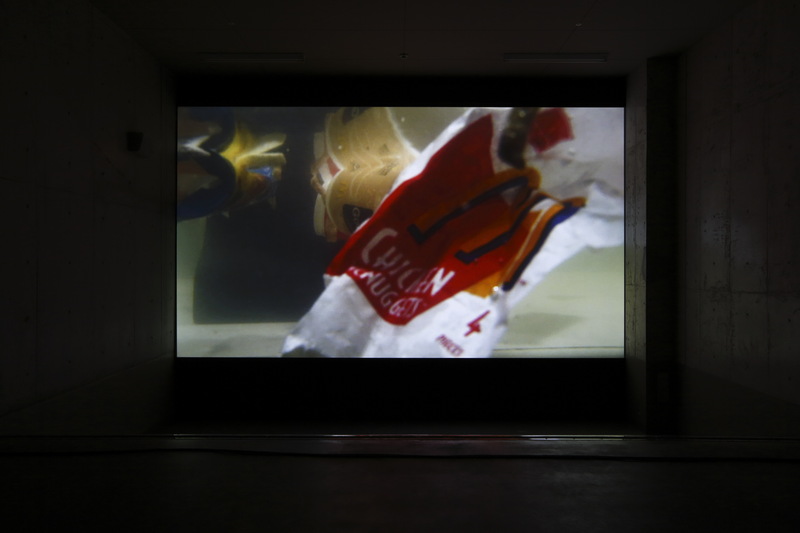 For the Dojima River Biennale, SUPERFLEX presented a site-specific installation of their video-work, Flooded McDonald’s (2009), a 21-minute film in which a convincing life-size replica of the interior of a McDonald’s burger bar, without any customers or staff present, gradually floods with water. Furniture is seen being lifted up by the rising waters, trays of food and drinks start to float around, electrics short circuit and eventually the space becomes completely submerged. 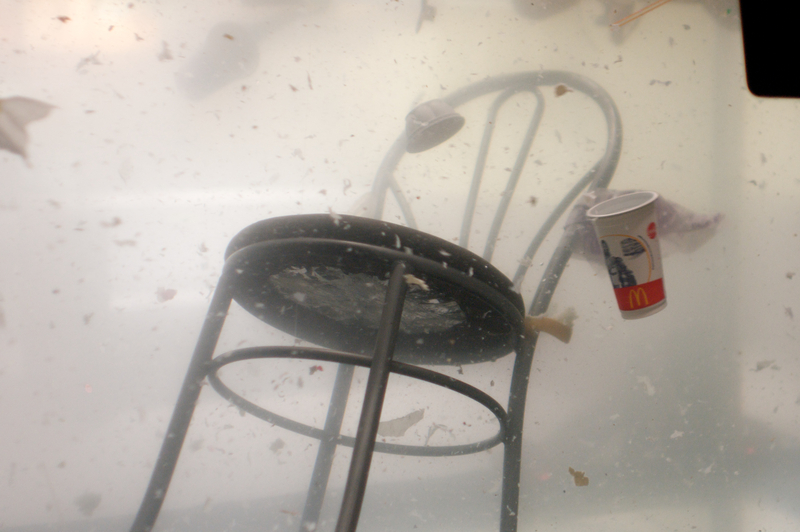 Flooded McDonald’s was originally produced in Ho Chi Minh City in collaboration with the Propeller Group (and in association with Matching Studio, of Bangkok), with all of the props made specifically for the film. In the context of Take Me To The River, the video was installed within the loading bay of the Forum, a utilitarian concrete space designed for lorries to reverse directly into the backstage area of the building from the street outside, separated from the nearby waters of the Dojima River, and the commercial heart of the city of Osaka, by a thin metal shutter. This entry was posted in Projects, Writings and tagged Dojima River Biennale 2015, Superflex. Bookmark the permalink.